After 35 years of fishing the rich trout lakes of the interior region of British Columbia there is no question as to what insect emergence I look forward to the most. The excitement begins building in late February, long before any lakes are ice free, but that is when chironomids begin hatching off the South Thompson River. I know we will be fishing chironomids on our favourite lakes in less than 2 months. 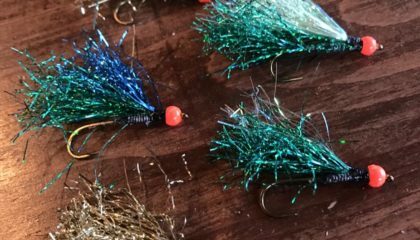 Chironomids or midge fishing is a pleasant, aesthetically pleasing way to fly fish. Cast out a floating fly line with a pupal pattern, wait for it sink to the appropriate depth, begin a slow hand twist retrieve and pause regularly to take in the scenery around you. Then watch or feel your fly line move slightly or take off and another trout is fooled. 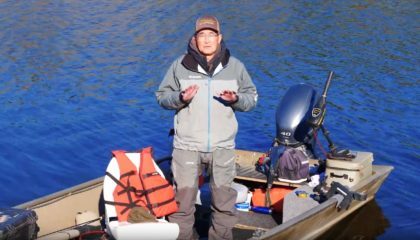 It sounds easy and it is, once you understand the chironomid life cycle and when and where trout feed on them. Not only are chironomids the first major insect hatch of the year, they continue to emerge in lessor numbers right up until freeze up. Chironomids are members of the dipteran order of insects, true flies having only one set of complete wings. Adult chironomids are similar in appearance to adult mosquitoes except they have plumose or feathery antennae and the female chironomid does not bite. Adult chironomids will range in size from 2 mm to 20 mm in length. The chironomid life cycle includes egg, larva, pupa and adult stages. The life cycle begins when females return en masse to the lake to deposit eggs. Typically, eggs are released as the female dips the tip of her abdomen in the surface film while flying low over the water. The eggs sink to the bottom and within 2 weeks hatch into the larva. The chironomid larva is worm-like in appearance with distinct body segmentation. Larvae live in the bottom or benthic areas of the lake in tubes constructed perpendicularly at the bottom/water interface. Larvae feed on detritus and can leave their tubes to forage but since they are poor swimmers spend most of their time in the tube intercepting drifting food. Chironomid larvae are often referred to as “bloodworms” because of their blood red colouration. This colouration is a result of living in poorly oxygenated water typically associated with deeper depths. A hemoglobin-like substance, which is maroon in colour enables the larvae to survive in such oxygen poor environments. Other larval colours include shades of green and dark brown. Once the larva is fully developed it will seal itself in the tube and transform into the pupal stage. It usually takes several weeks for the change to occur. The pupa then cuts its way out of the old larval tube and with the aid of trapped gases under the thorax and abdomen, rises slowly to the surface of the lake. Common pupal colours are black and various shades of green, brown, orange and maroon. The majority of chironomids pupate or hatch from shallower depths of from 1 to 6 meters deep. It is the pupal ascent that attracts the attention of trout. Upon reaching the surface, a split forms along the back of the thorax and the adult chironomid crawls out and flies off. Mating occurs within a day of hatching and the cycle is completed. Chironomid larval imitations are best fished close to the bottom of the shoals or drop-off areas (generally less than 6 meters deep) as this is their prime habitat. A floating fly line and varying leader lengths (3 to 7 meters) will allow effective coverage of these shallower depths. 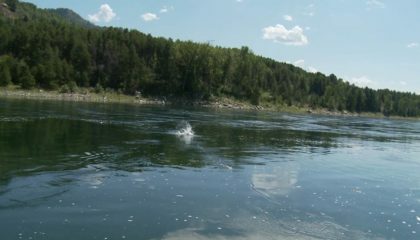 It is very important to allow the fly enough time to reach the depth zone you want to fish before beginning the retrieve. Weight your larval pattern or add soft putty lead to a tippet knot to get down to the bottom quicker. Larval patterns should be retrieved very slowly or allowed to drift in the wind. It’s always good to intersperse an occasional quick pull to imitate the twitching motion. It’s the pupal ascent that really gets fish and fly fishers excited. A typical chironomid emergence would see literally thousands of pupae rising to the surface. Individual trout inhale hundreds by just swimming through the water column. Over the years of fishing chironomids, I have found that the major hatches occur between 10 A.M. and 3 P.M. Remember that chironomids can be hatching in very deep water. It is not uncommon to be anchored in 12 meters of water and successfully fishing pupal patterns. The majority of hatches do occur in shallower water (3 to 5 meters deep). These emergences allow the use of floating lines and varying leader lengths. You want to be able to cover the entire depth zone you are fishing. The floating fly line acts as a long bobber. 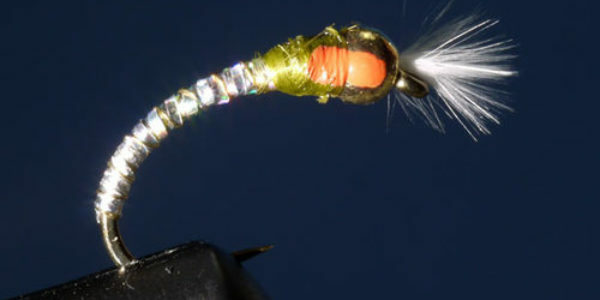 The key to successfully fishing this technique is to allow sufficient time for your pupal imitation to sink to the desired depth before beginning your retrieve. Use the countdown method to determine where your fly is in relation to the bottom of the shoal. Let’s suppose you are anchored in 5 meters of water and fishing with a 6 meter long leader and weighted pupal pattern. Try waiting 90 seconds before beginning the retrieve. If you snag bottom weeds during the retrieve, reduce the amount of time waited on the next series of casts. If you do not get any strikes fishing close to the bottom then further reduce the wait time before starting to retrieve. 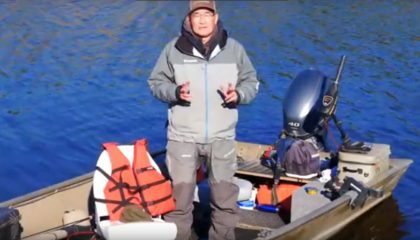 This method allows you to cover all possible depth zones that the trout may be feeding in. How slow is a chironomid pupa retrieve? It may take 10 minutes to retrieve a 20 meter long cast! I prefer to use a hand twist retrieve as it keeps my hands busy. The biggest mistakes made when fishing chironomids with a floating line are 1) not waiting long enough for the fly to sink, and 2) retrieving much to fast. Remember, the pupa does not swim to the surface but rises ever so slowly. Sometimes the trout will only feed on the pupa at a very precise or narrow depth zone in the water column. This is when a strike indicator works, as it will maintain your pupal pattern at a precise depth. Make sure you don’t take your eyes off the indicator, as the strike can be very subtle. Intermediate sinking lines which are the slowest sinking lines made are also effective for fishing chironomid larvae and pupae. The very slow sink rate in combination with a slow hand twist retrieve will allow effective coverage of specific depth zones. A chironomid hatch occurring over deeper water (more than 8 meters) can be fished with full sinking lines. One of my favourite techniques is to use an extra-fast sinking line and cast it out only as far as the depth I am anchored. 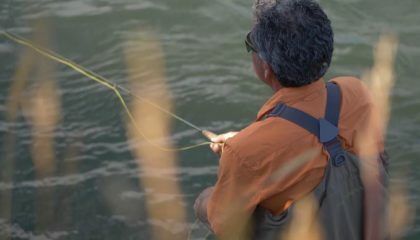 Allow the fly line to sink until straight up and down and then begin a very slow hand twist retrieve right to the surface of the lake. One word of caution, trout hit the deep-water chironomid hard so be prepared for the rod to be almost yanked out of your hand! At other times trout will take the pupa just under or in the surface film. The angler will see subtle head and tail or slow bulging riseforms in this situation. Shorten your leader to approximately 4 meters, grease it well to make it float and fish a pupal pattern as close to the surface as possible. Trout will sometimes feed on the egg laying adult chironomid. Females typically return to the lake in the evenings when winds are down and darkness approaches. In most situations, individual trout will show a distinct movement or feeding pattern, which will allow you to anticipate its speed and direction of travel. Cast an adequate distance ahead of the fish with a floating adult pattern. As soon as the fly hits the water give it a couple of long fast strips so that it forms a wake on the water, then let it sit for a few seconds before repeating the fast strips. 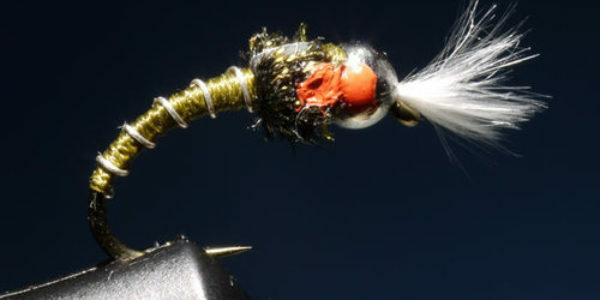 Whatever techniques you use for fishing the chironomid larva and pupa it is important to have complete control over your fly line so that strikes are not missed. It is essential to double anchor your boat (bow and stern) so that changes in wind direction will not swing you from side to side or in circles. Float tubers or pontoon boat anglers should have one anchor out the back and then use their swim fins to control unwanted sideways motion. 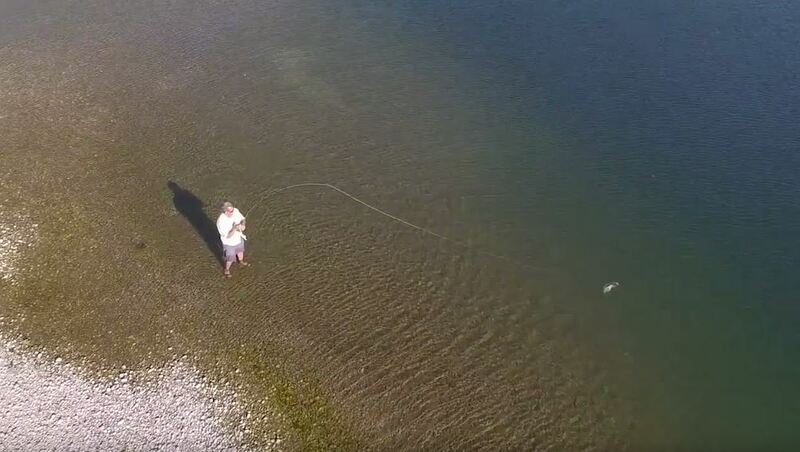 Also, keep your rod tip close to or touching the water during the retrieve thus providing as straight a line connection between rod, fly line, leader and fly. This is the best position for detecting even the slightest of strikes. In the Southern Interior, chironomid hatches are usually in full swing by the second week of May. Lower elevation lakes can have good hatches coming off by mid-April. As the season progresses, chironomid addicts fish higher and higher in elevation to prolong the enjoyment of this most exciting hatch.